The Martin 000-18E Retro Electro-Acoustic Guitar has a Solid Sitka Spruce top with the back and sides crafted from solid genuine Mahogany. Also featuring an Ebony fingerboard with 20 frets and an elegant natural finish. 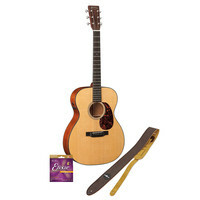 The 000-18E also comes with a free set of Elixir .011-0.52 acoustic guitar strings and a Gear4music guitar strap in Tan. This entry was posted in Martin and tagged Guitar-and-Bass. Bookmark the permalink.